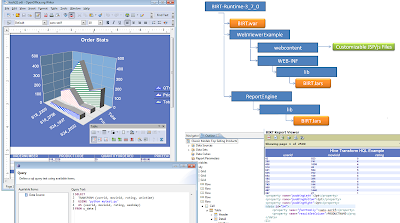 BIRT 3.7 is now available and with this release many improvements and new features are available. BIRT 3.7 now provides a new POJO based runtime for ease of deployment when using the BIRT Viewer or the Report Engine. Open Document Text (ODT), Open Document Presentation (ODP), and Open Document Spreadsheet (ODS) outputs are also available with the addition of three new emitters. BIRT now provides support for Hadoop through a new Open Data Access Driver (ODA) that allows the developer to build queries using Hive Query Language (HQL) using the designer GUI. To read more about these and other new features for BIRT, see the BIRT 3.7 New and Notable.